Manufacturers and other industries generate a variety of different wastes in the form of solid, liquid, gas, and a combination of the three. Generally, a waste consists of any product that is no longer needed or that can no longer be used for its intended purpose. Based on its effects, waste from businesses may be classified as either hazardous or non-hazardous. Hazardous waste describes a waste that has the characteristics that make it potentially harmful or dangerous to the human health or the environment. 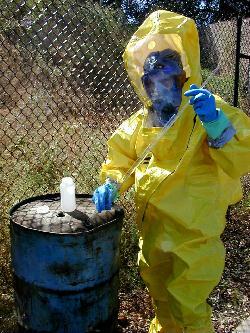 In the United States, 70 percent of hazardous waste is generated by the chemical and petroleum industries. However, the spectrum of hazardous waste production is large and diverse. Both large and small generators produce solids, liquid, gas, sludge, and other byproducts through manufacturing processes, disposal of unused materials or getting rid of unused commercial products. Under the authority of the Resource Conservation and Recovery Act (RCRA). EPA's regulations establish two ways to determine the definition of a hazardous waste. Hazardous waste can be found on four hazardous wastes lists— F - list, K - list, P - list, or U - list or determined by applying the four characteristics of hazardous wastes. Each of the hazardous waste listings contain anywhere from 30 to hundreds of waste streams. The waste on the lists has an assigned waste code, which consists of the letter associated with the listing and followed by three numbers. You can find further information about the F listing in 40 CFR §261.31(a). P and U Listed Hazardous Wastes — Both of these hazardous waste listing deal with certain commercial chemical products or CCPs that are discarded or intended to be discarded. The P and U listed categories contain generic names of chemicals, off-specification products, chemical spills and container residues. The primary difference between the two lists is that the P list identifies acute hazardous wastes and the U list identifies toxic wastes. Ignitable — This type of waste, which includes waste oils and used solvents, can lead to fires under certain conditions, create spontaneous combustion, or has a flash point at certain temperature. Corrosivity — Corrosive wastes consist of materials such as solids comprised of acids or bases, or generates alkaline or acidic solutions, or liquid waste that may corrode metal containers. Reactivity — This property refers to wastes that are “reactive or unstable under normal conditions, which could cause explosion or release toxic fumes, gases, or vapors under certain conditions. Toxicity — Toxic wastes refer to wastes that are harmful or fatal when absorbed or ingested . Examples are wastes that contain DDT, PCBs, mercury, and lead. To make a hazardous waste determination involves a complex task that is critical part of the hazardous waste rules Whether you are a large generator or small generator, the management of your waste stream must comply with regulations, which are strictly enforced by the Environmental Protection Agency (EPA) and the appropriate state agency.